Learn about Boston's central role in the Civil War -- the war that many call the nation's "second revolution." Boston was the Hub of Abolitionism: anti-slavery Bostonians, inspired by the legacy of liberty of the American Revolution, were determined to honor and extend that legacy to include freedom for slaves. When war came, the first soldiers to die in combat were from Massachusetts. Bostonians played a leading role in persuading President Abraham Lincoln to wage war against slavery, and the first black regiment recruited in the North was formed in Boston. Barbara F. Berenson is the author of Boston and the Civil War: Hub of the Second Revolution and Walking Tours of Civil War Boston: Hub of Abolitionism. Her next book will address the pivotal role of Massachusetts in the Woman Suffrage Movement. © 2018 Barbara F. Berenson, all rights reserved. Walking Tours of Civil War Boston is an official guidebook of the Freedom Trail Foundation®, Boston, MA. Freedom Trail® is a registered trademark of the Freedom Trail Foundation. 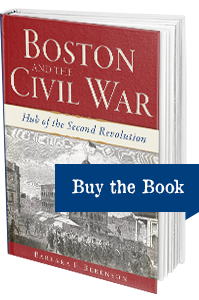 Boston and the Civil War: Hub of the Second Revolution is published by The History Press.